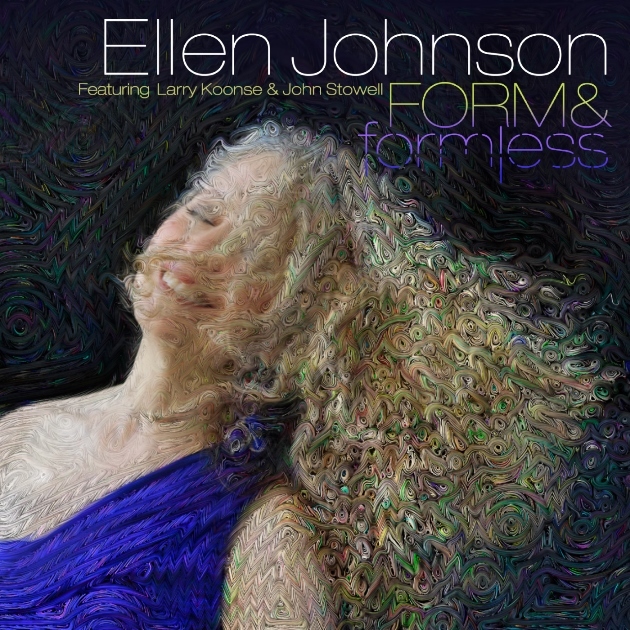 In some ways the album cover for Ellen Johnson’s Form & Formless reminds one of a Vincent Van Gogh painting, as the image is comprised of a mix of solid lines and portions of the image, which are less defined. The image prepares the listener for the music they are about to hear. Ellen Johnson explains, “That's interesting about Van Gough, but I thought of it much like a painting as well. If you get up close to the computer images they are really fascinating. It is hard to tell on the little CD cover. I was thinking of it more as going from something concrete to an atomic structure. The idea is that we see form from our limited point of view but there is a world of atoms all around us, just like in music when we hear a song, but there are vibrations happening that we can't perceive other than through the song form. It is a way to experience what's beyond all of this and the idea of perception. As for the music that appears on the album, she says, “We had no preconceived idea of what we were going to be doing. We had no charts, no sheet music or anything. We never discussed hey let’s do this here or let’s create this there. We never discussed anything, so here we were. I was in my little studio booth and John (Stowell) was in his little studio booth and somebody started and out of that a song occurred. What makes the idea of improvisation work is listening to each other intently and being sensitive to each other. It is being able to work when somebody can be a leader and somebody can be a follower. It changes at different times. For five of those songs we had no idea of what was going to come out or where the middle or the ending would be. We just created them on the spot. There were not any charts, there was no discussion, we just started singing or (playing) something instrumental and then we created out of nothing. It was like having a blank art canvas with no preconceived idea of what was going to be painted. John Stowell did four of those pieces with me and Larry Koonse did one. I then did five songs that were already constructed pieces, “Naima,” “Sonny’s Isle of St. Thomas (also known simply as St. Thomas),” “’Round Midnight,” “Weird Nightmare,” and “Nature Boy.” Larry Koonse played on all of those except one, “Nature Boy,” and John Stowell played on that one. I compared it to the Yin Yang symbol as in one white spot in the black and one black spot in the white. For the form songs we were "recreating" them in some capacity by putting our own interpretation to each song and improvising through the changes with our own interpretation in the moment. Out of form we can create a formlessness interpretation and out of the formless we create a new form. It's based on the Taoist philosophy of life. 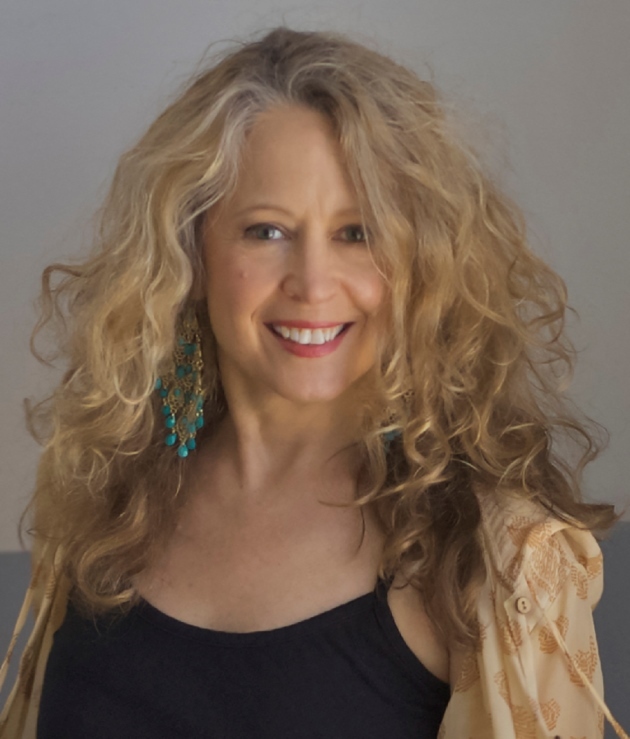 One of the prettiest songs on the album, an original tune, “Fiona Flanagan’s Fable,” has an accompanying video that was created by Jeff Foster, Ellen Johnson’s husband who used a drone for his aerial videography. The mood is peaceful and Ms. Johnson’s vocals absent lyrics are both enchanting and mystical, while John Stowell’s guitar is subtle, elegant and articulate. Ellen Johnson takes a moment to talk about “Fiona Flanagan’s Fable.” “It is one of those free improvisations. The family name for my grandmother on my father’s side was Flanagan and they were Celts. When I was sitting in the studio waiting for this moment to happen for whatever was going to come out of me, I started to hear Irish flute and I started to follow that direction with my voice. When I got done with this piece, it just felt like I had gone to some place in my past. I have never been to Ireland, so I was just imagining this whole scene of being in Ireland for some reason. The title pays homage to my family Flanagan. There is also another humorous angle to this. I do an Irish accent sometimes. Sheila Jordan (Jazz singer) loves it when I do this character. I named her Fiona Flanagan, Flanagan, because of my family name and my Irish accent. I just put Fiona in there, because I felt it was a part of me and a part of my heritage. (Then breaking into an Irish accent she says) ‘You want to hear a bit of Fiona, so she comes in and she tells Sheila, Sheila don’t you be worryin’ about anything, everything is going to be workin’ out for ya’ just fine.’ Sheila just cracks up everytime that I do this. It is a little fun thing. When the song was finished it felt like a story. She explains, “It is hard to describe it. It just comes out of me. It is almost like you are channeling voices or something and I am using properties of my articulator to create these sounds. I got these sounds that (are similar to) electronic effects and they sounded like I was under water. I want to make sure that people know that was not tweaked in any way. That is how it came out with the voice. At the beginning of “Weird Nightmare,” when I did those sounds they put a bit of reverb on that, just to make it sound a little bit spooky. That is what I mean by nothing was used in terms of effects to create some of the sounds that you hear, especially on the free improvisation. The seagull on “St. Thomas,” was my sound. I did that. I do it in real time. I didn’t come back and put it in. I do it when I perform. My husband gets a kick out of that when I do it live. For me it is using the voice in (all of its) creative potential and forms of expression. I know I would have been able to play the part of Jonathan Livingston Seagull and that would have been wonderful,” she says in response to our poking fun at a missed opportunity for the 1973 movie, but there is always hope for a remake of the film. As for some of the other songs that comprise Form & Formless, Ms. Johnson says, “John Coltrane’s “Naima,” “’Round Midnight,” (Thelonious Monk / Cootie Williams / Babs Gonzales) and also “St. Thomas,” (Sonny Rollins with lyrics by Ellen Johnson) were songs that I learned many years ago in Chicago when I was first learning Jazz music. I was in an instrumental Jazz workshop that met once a week with an incredible pianist named Willie Pickens. When I first learned to sing Jazz I learned these kinds of songs and I didn’t learn standards. I knew standards from musical theater, but as far as my first Jazz experience as a singer, I sat in the horn section and all I did was sing their lines and I never even sang lyrics. I learned “Naima,” I learned “’Round Midnight,” I learned “St Thomas,” I learned Charlie Parker tunes and I learned Miles Davis tunes. These tunes are very special to me, because they were my foundation. Nolan Shaheed’s trumpet introduces “Round Midnight,” and Ellen Johnson’s vocals entice the listener with lyrics that counsel about the bliss of romance. Having Nolan Shaheed play his trumpet on the song was not planned and Ms. Johnson refers to it as “another improv.” Mr. Shaheed was in the studio noodling on his trumpet, while “’Round Midnight,” was being played and Ellen Johnson made the decision to have him play on the song. Ms. Johnson continues, “Naima,” didn’t have any lyrics and “St Thomas,” didn’t have any lyrics. Back in 1976 or ‘77 I ended up writing some lyrics for “St Thomas,” because I just wanted to sing it with lyrics. I wanted to capture how it felt to me. Fast forward to sometime around 2008 or ’09 or ’10 or whenever it was and I contacted Sonny Rollins to approve them. He loved them and he published them through his publishing company. That was a big thing for me, because it was Sonny Rollins’ tune. I felt that was great. That was special. I had lyrics for “Naima,” and for this recording project I contacted the Coltrane family and at first they said they loved them and they approved and everything was fine. The week before I went into the recording studio they changed their minds. So, here I was and I was thinking what am I going to do? I had learned “Naima,” as an instrumental, so I said I am just going to sing it as an instrumental piece. That was an improvisation too and then I went oh I think I will layer it. The lyrics that I had written were the connection between “Naima,” and the ocean, so what I heard in my mind were these ocean waves coming and going. That is how I imagined the piece. That is why the layering for me is these different ocean waves coming in and out. As most things happen in life, sometimes one door closes and another door opens and you find something else that works and maybe works better than the original plan. I still like my lyrics for “Naima,” but this worked nicely for this project. As far as “Weird Nightmare,” I just go back to my love for Charles Mingus. I have been doing his vocal music from recording number one. I just love his music and it has always been a part of something that speaks to me. “Nature Boy,” (Eden Ahbez) wasn’t really planned, but the reason I really like that song is the message that the greatest thing that you can ever do is to love and to be loved in return, which I think is a beautiful statement about life.